It’s May first in Wisconsin, and once again it’s freezing. 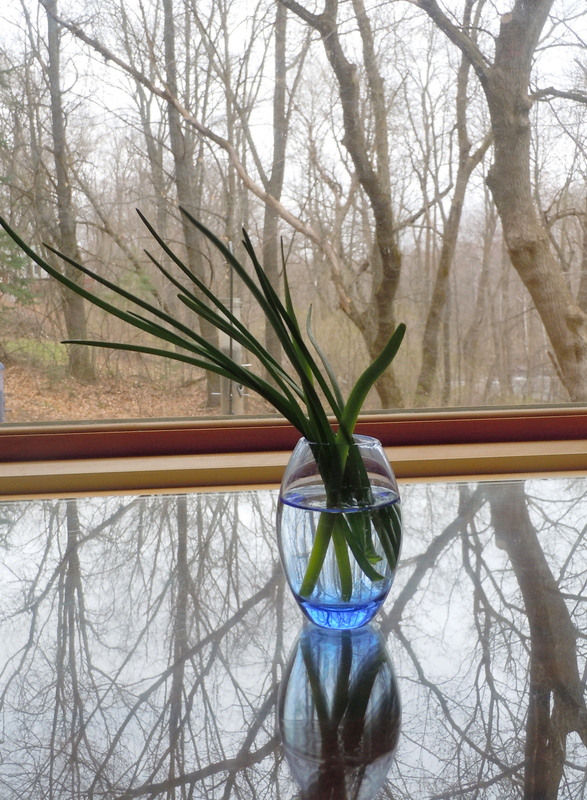 My garden is empty and forlorn, lonely for the plants that can’t go in until this crazy cold goes away for good. We decided to pretend it was a nice spring Saturday, and grill out. Luke was at a friend’s house, studying for their upcoming AP exams, so it was just Tom and me (and the pups, of course). We cranked the iPod (nothing like some Bruno Mars and then a little Stevie Wonder to get the weekend mood going). I poured a glass of wine, Tom made a drink, and we slowly made dinner. This is my idea of heaven, by the way: the grill heating on the deck, great music in the background, great company (today just me and Tom, but that’s enough) while we prepare a delicious meal. Today’s menu: green salad with chickpeas and gorgonzola, drizzled with a tangy balsamic/Dijon vinaigrette, and topped with slices of grilled flank steak. 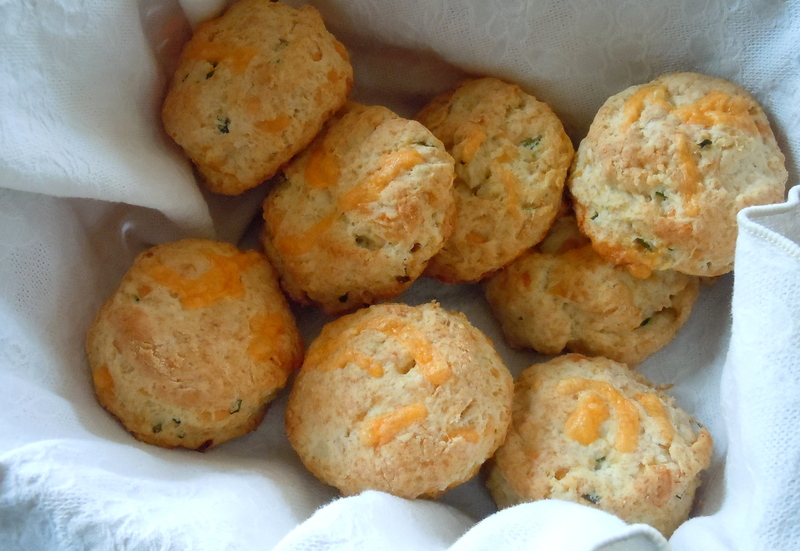 As an accompaniment, I made cheddar-chive biscuits. In fact, the entire meal started with those biscuits, since they feature the only plant in my garden ready for harvest: chives. The Silver Palate cookbook was my inspiration. 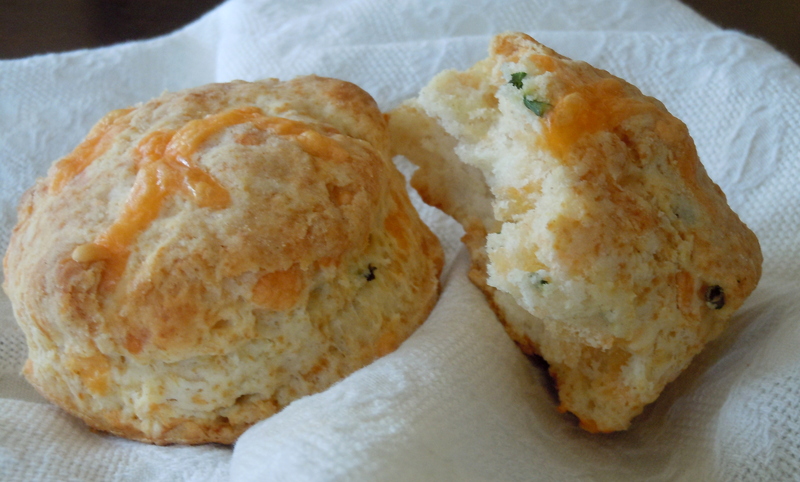 Their Jalapeño-Cheddar Biscuits make frequent appearances in our house. I used exra-sharp cheddar instead of the pepper-jack, and added minced chives from the garden. There wasn’t any half-and-half in the fridge, so I used sour cream mixed with whole milk. These morsels of deliciousness are not what you’d call good for you (except, perhaps, spiritually), but we were, after all, having salad for dinner. I‘ve never mastered those biscuits that split into layers, but these are light, flaky, and rich enough that we don’t miss them. 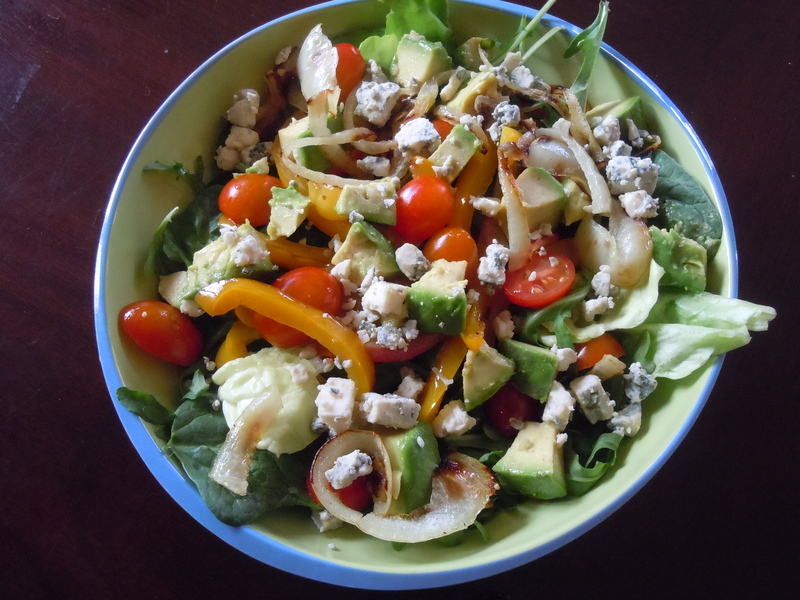 When making the salads, we went a little overboard with the veg — arugula and butter lettuce, grape tomatoes, chunks of avocado, and julienned onion and yellow bell pepper sautéed until tender and golden. But it all harmonized quite well: the sweet onions and peppers were in balance with the tangy vinaigrette, the acid from the vinaigrette balanced the richness of the beef and cheese. All in all, a beautiful, satisfying, and relatively healthy dinner. If you don’t count the biscuits. Heat the oven to 425°F. Stir together the flour, sugar, salt, and baking powder in a mixing bowl. Using your fingers, smear the butter into the flour mixture until the mixture resembles peas. Don’t spend too much time on this part; you want the butter to remain fairly cold. You can use a pastry cutter or two butter knives instead, if you prefer. Stir in the half-and-half just until combined. (You can use your hands here again, but it is seriously messy. A wooden spoon works very well too.) Add the cheese and chives and give a quick stir. Dump the dough out onto a lightly floured countertop. Knead a few times, just to bring the dough together, and pat out into a rectangle about 1 inch thick. Cut into circles about 2 inches in diameter with a cookie cutter (I use a juice glass). Dip the cutter (or glass) into flour before each cut, and rotate the cutter several times to help to release the dough. Place the circles on a cookie sheet about 1 inch apart and bake for 15 minutes, until they’re puffed and light gold on top. They’re at their best eaten while still warm. This entry was posted in baked goods, sides and tagged biscuit, cheddar, cheese, chive. Bookmark the permalink.